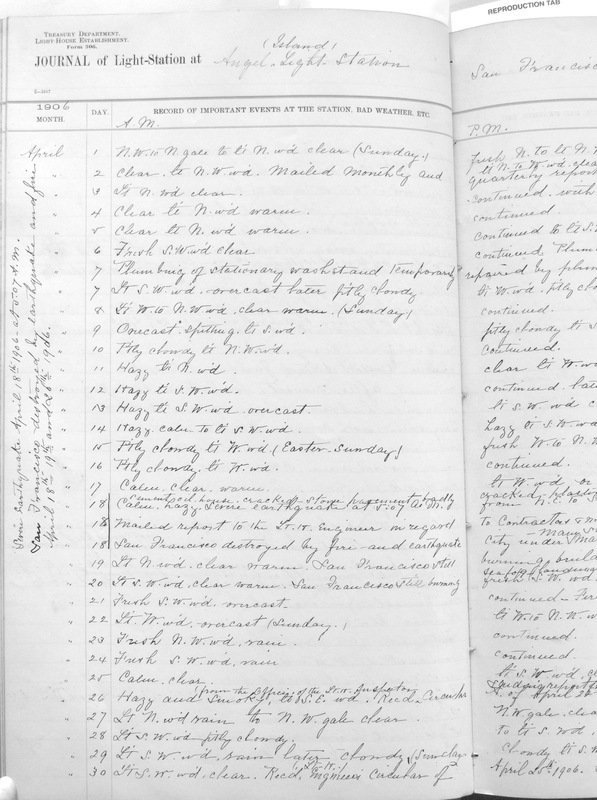 I have made the National Archives RG 26 finding aid “List of Logbooks of U.S. Coast Guard Cutters, Stations, and Miscellaneous Units, 1833 – 1980” available at https://lighthousehistory.info/research/uslhs/rg-26-finding-aid-for-logbooks/. Note that lighthouse keepers were not required to keep a daily log until 1872. Many logs are missing. Logs for the WWII era when the U.S. Coast Guard was part of the U.S. Navy are listed in a different finding aid. 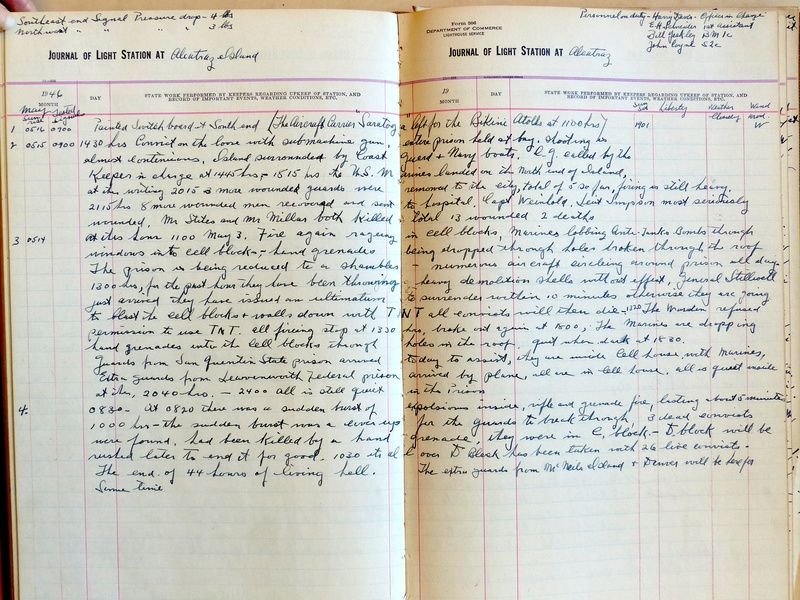 Lifesaving station logs from the USLSS period are kept at regional Archive facilities. May 2: 1430 hrs. Convicts on the loose with submachine gun, entire prison held at bay. Shooting is almost continuous. Island surrounded by Coast Guard and Navy boats. C.G. called by the Keeper in charge at 1445 hours. 1815 hrs. The U.S. Marines landed on the north end of island, at this writing. More wounded guards were removed to the city, total of five so far, firing is still heavy. 2115 hrs. Eight more wounded men recovered and sent to hospital. Capt. Weinhold, Lieut. Simpson most seriously wounded, Mr. Stites and Mr. Miller both killed. Total 13 wounded, two deaths. May 3: 1100 hrs. Fire again raging in cellblocks, Marines lobbing anti-tank bombs through windows into cellblock; hand grenades being dropped through holes broken through the roof. The prison is being reduced to a shambles – numerous aircraft circling around prison all day. 1300 hrs. For the past hour they have been throwing heavy demolition shells without effect. Gen. Stillwell just arrived; they have issued an ultimatum to surrender within 10 minutes otherwise they are going to blast the cellblocks and walls down with TNT; all convicts will then die. 1320 hrs. The warden refused permission to use TNT. All firing stopped at 1330 hrs. Broke out again at 1800 hrs. 1800 hrs. The Marines are dropping hand grenades into the cellblocks through holes in the roof, quit when dark at 1830. Guards from San Quentin State prison arrived today to assist, they are inside cell houses with Marines. Extra guards from Leavenworth federal prison arrived by plane, all are in cell house. All is quiet inside at 2040 hrs. 2400 hrs. All is still quiet in the prison. May 4: 0820 hrs. There was a sudden burst of explosions inside, rifle and grenade fire, lasting about five minutes. 1000 hrs. The sudden burst was a cover up for the guards to break through. Three dead convicts were found, had been killed by a hand grenade, they were in C block. D Block will be rushed later to end it for good. 1030 hrs. It ‘s all over. D Block has been taken with 26 live convicts. The end of 44 hours of living hell. The extra guards from McNeils Island & Denver will be here for some time. The Alcatraz lighthouse was automated and the prison closed in 1963. Alcatraz Penitentiary is now a unit of the Golden Gate National Recreation area. 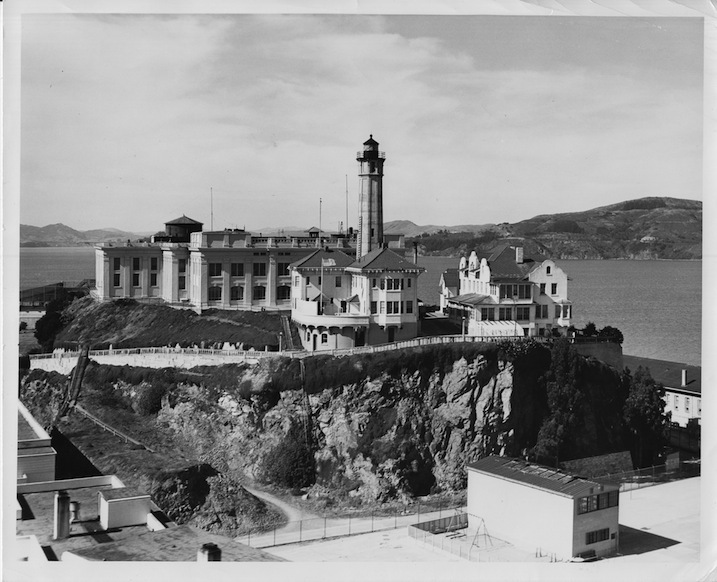 This entry was posted in Historic images, Lighthouse keepers, Research and tagged Alcatraz Island, Alcatraz Lighthouse, Alcatraz prison, Lighthouse Keeper Henry Davis, lighthouse logs on July 22, 2015 by lighthousehistory. While working in my digital research library, I recently revisited several letters written by the Secretary of Treasury Alexander Hamilton. As you know, the Secretary of Treasury oversaw lighthouses in the early years of the new republic, with frequent oversight from President Washington. 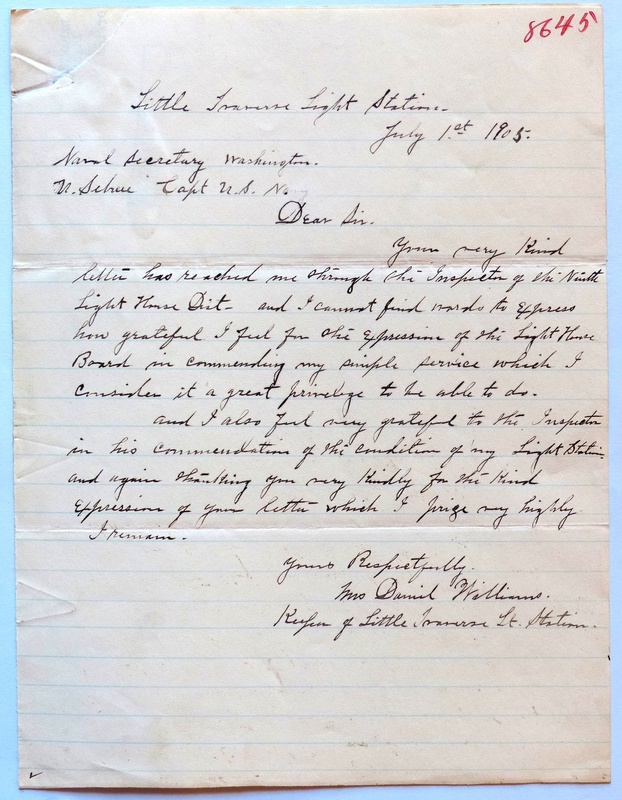 The letter also instructed Lincoln to confirm the appointments of four keepers who were already keeping the lights at Boston Harbor, Cape Ann, “Plumb” Island, and Nantucket. Hamilton mentioned the “widow of the late General Warren” as keeping the lights at Plymouth. I believe he was actually referring to Hannah Thomas, widow of John Thomas. When General John Thomas went off to fight in the Revolution he left his wife Hannah in charge of the twin lights at the entrance to Plymouth Harbor. Our book Women Who Kept the Lights begins with a chapter on Hannah, the first known female lighthouse keeper in the U.S. 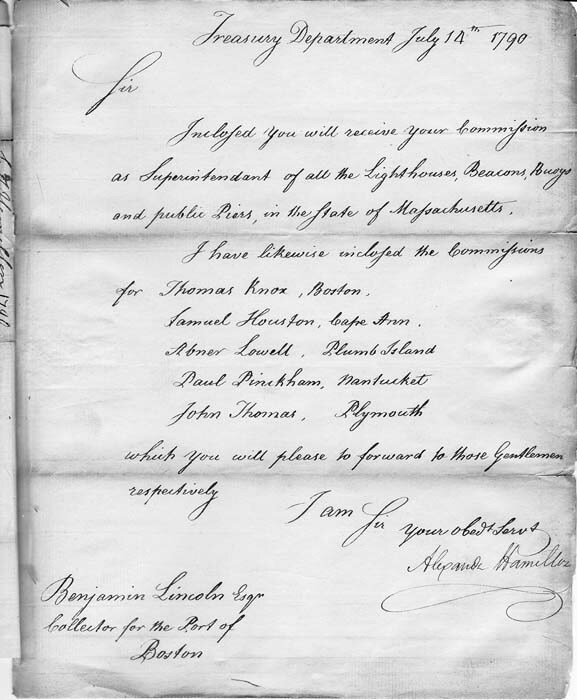 The July 14 letter shown here indicates that Hannah’s son John Thomas, Jr., received the appointment at Plymouth. He set their salaries based on what the Colony of Massachusetts had been paying them. The Boston keeper received $400, Plymouth $240, Cape Ann $400, Plumb Island $220, and Nantucket $250. 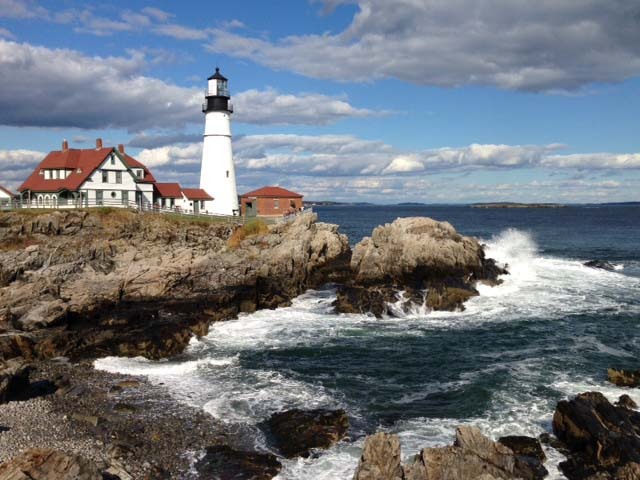 This entry was posted in Lighthouse administration, Lighthouse keepers, Research and tagged Alexander Hamilton, Portland Head on May 9, 2015 by lighthousehistory. Cheryl Shelton-Roberts and Sandra MacLean Clunies have produced a unique book based on the genealogical research they did for the Bodie Island Keeper Descendants Reunion that took place at Bodie Island Light Station last October. 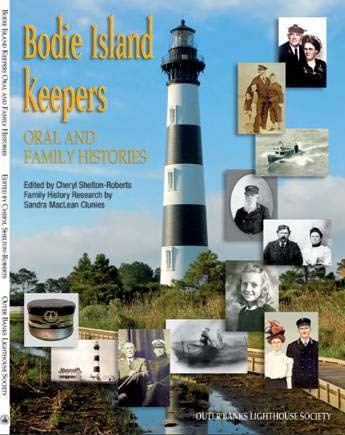 Published by the Outer Banks Lighthouse Society, the book features short essays on the keepers with lots of photos of them and their families. The reunion attendees must have been delighted to learn so much about their ancestors. There may still be copies available for purchase through the Society. Email Diana Chappell –diandmanda at aol.com — for more information. This entry was posted in Lighthouse keepers and tagged Bodie Island Lighthouse on May 6, 2015 by lighthousehistory. I recently attended the Council of American Maritime Museums conference hosted by the Los Angeles Maritime Museum. Upon arrival in Los Angeles I went directly from the airport to the Point Fermin Lighthouse, where historic site manager Kristen Heather gave me a delightful tour. The tower was designed by Paul J. Pelz, a U.S. Light-House Board draftsman. The stick-style design was used for six lighthouses. Pelz also worked for the U.S. Life-Saving Service and designed several of their stations. Front parlor at Point Fermin Lighthouse. The station is now a museum run by the City of Los Angeles. The visit was especially meaningful because the first keepers of Point Fermin Light, when it was established in 1874, were sisters Ella and Mary Smith. Although I realize these women had challenges living in such a remote location, I think it would have been a rather plum assignment when compared to many other light stations of that period. The interior exhibits interpret the lives of the station’s four keepers and their families. The fourth-order Fresnel lens is on display in one of the ground floor rooms and visitors can climb to the top of the tower for a spectacular view. Kristen Heather, the Point Fermin’s historic site manager, has worked with the property for over a decade. Lovely gardens surrounding the property are maintained by volunteers. For more information on this wonderful station, visit the Point Fermin Lighthouse website or read Point Fermin Lighthouse Families by Henrietta E. Mosley. The next morning I ventured further down the coast to Point Vicente Light Station. Unfortunately it was closed. Although generally open on the second Saturday of the month, April was the exception. Apparently it was open the previous weekend for a whale watching festival. However I enjoyed walking along the cliffs capturing views of the lighthouse at a distance. The lantern plan for Point Vicente. Pointe Vicente had a larger lens than Point Fermin so could be seen at greater distances. Note the diagonal astragals. Fortunately the CAMM conference included a narrated cruise of the harbors of San Pedro and Long Beach so I was able to capture the San Pedro Breakwater Light, also known as the Los Angeles Harbor Light and locally as “Angels Gate.” Still an active aid to navigation, the tower is located at the end of two-mile breakwater. It welcomes all types of vessels into the nation’s busiest container port. In 1928, Los Angeles Harbor Light Keeper Frank Weller described his duties as consisting of: Standing watches and upkeep of station and grounds, illuminating apparatus, fog signal engines, motors and generators, radio beacon apparatus, aga beacons, oil beacons, gas buoys, motor launch, sail and rowboats. The Fresnel lens from the Los Angeles Harbor Light is on display at the Los Angeles Maritime Museum. The watches average eight or more hours a day. The first watch is from sunset to 11 p.m. . . . The man on watch starts to light up I.O.V. lamp by heating up the lamp with alcohol; keeps a good light at all times; sees that clockwork and lens is on time; keeps watch on the weather; operates radio beacon for fifteen minutes every hour from 6 p.m. to 6 a.m.; and in foggy weather or smoky weather operates fog signal continuously. . . . Weller had started out as an assistant keeper in 1916. He became keeper around 1922. In 1928 he had two assistants–James E. Dudley and Herman L. Francis. Apparently life at this “bachelor station” was challenging for the assistant keepers. Their high turnover rate indicates that it was not a popular assignment. The Los Angeles Harbor Light was manned until the light was automated in 1973. The Los Angeles Maritime Museum is located in the old ferry terminal on the San Pedro waterfront. This entry was posted in Architectural drawing, Books, Contemporary images, Historic documents, Historic images, Lighthouse construction, Lighthouse keepers, Lighthouse preservation on April 25, 2015 by lighthousehistory. Unless noted, all of these records are located at the downtown Washington, D.C. facility. 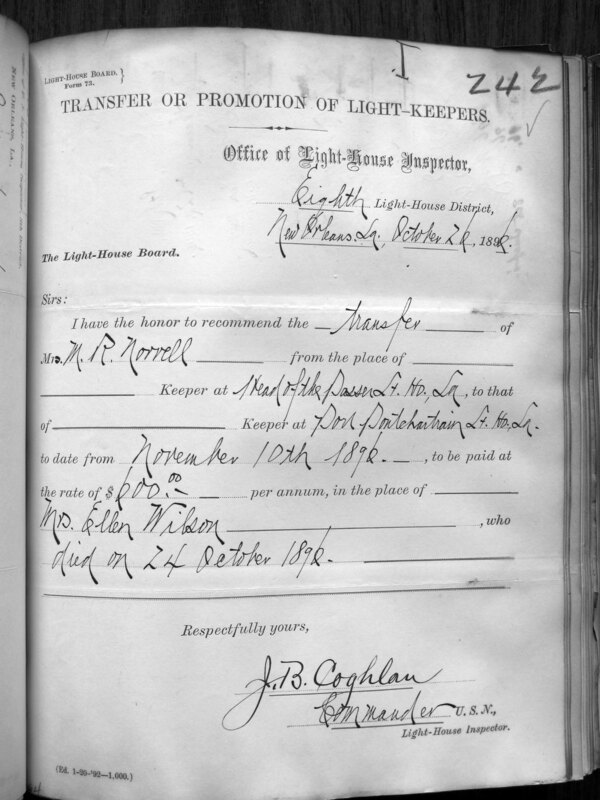 It is fairly easy to compile lists of keepers for lighthouses between 1848 to 1912 by using the Registers of Keepers available on microfilm. M1373 consists of 6 rolls, arranged geographically. All registers include an index; later registers are indexed by both the station and last name of the keeper, so if you know the keeper’s name it is fairly easy to find where he or she served. Letters from keepers are rather rare. If your keeper served in the 5th, 7th, 9th, or 12th districts around the turn of the 19th century, there may be letters written by the keeper to his or her boss, the district inspector. These letters were bound into volumes by the district office. Some have an index at the back of the volume; others are indexed in a separate volume. Found in RG 26 Entries 3, 5, 8, and 9 (NC-63). See my RG 26 finding aid for more information on these entries. 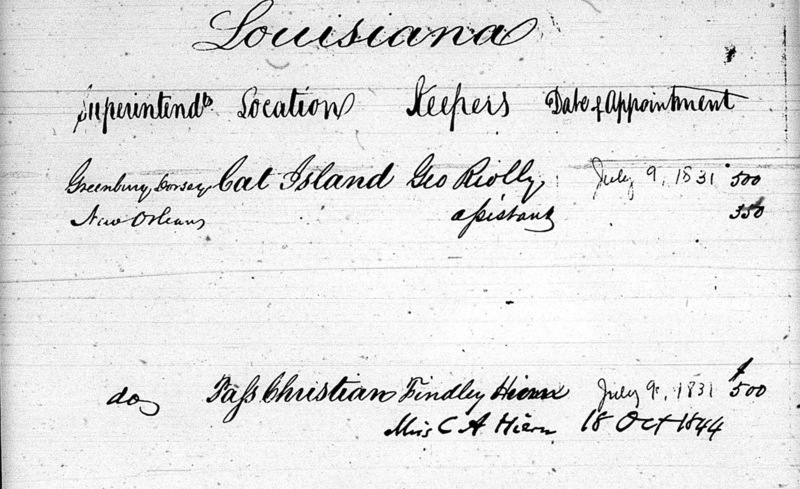 The National Archives staff put together a database of lighthouse keepers mentioned in correspondence found in RG 26 Entries 82, 85, 16, 17I and 259. It also includes ship crew, inspectors, and lifesaving service personnel. You can access the database with the help of a maritime archivist in the finding aids room or see a modified version as this searchable PDF. 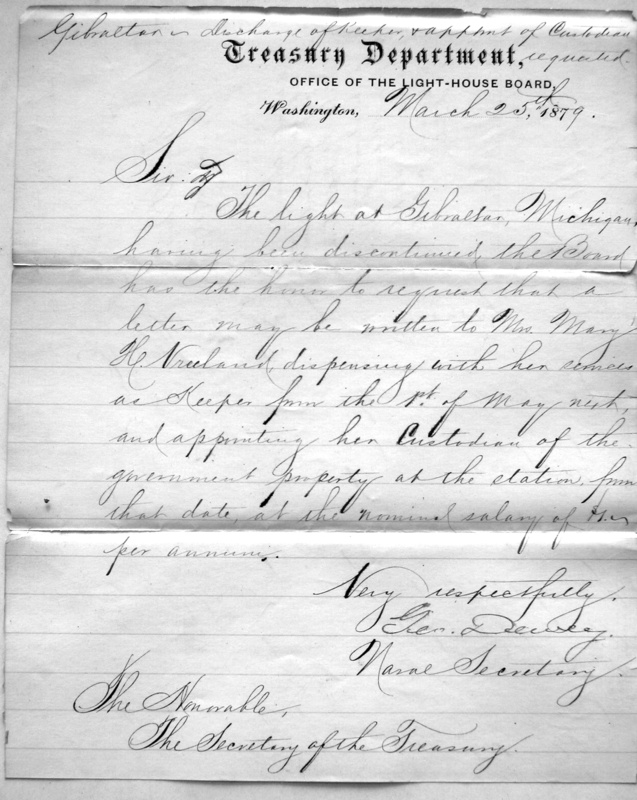 You can also find letters regarding appointments and personnel changes during the U.S. Light-House Board (USLHB) period in the correspondence from district inspectors in RG 26 Entry 24 (NC-31). The original letters were bound into letterbooks, many of which burned in the 1922 fire. There is an index of these letters in RG 26 Entry 38 that provide summaries of each letter received. RG 26 Entry 32 (NC-31) “Letters Sent by Treasury Dept. 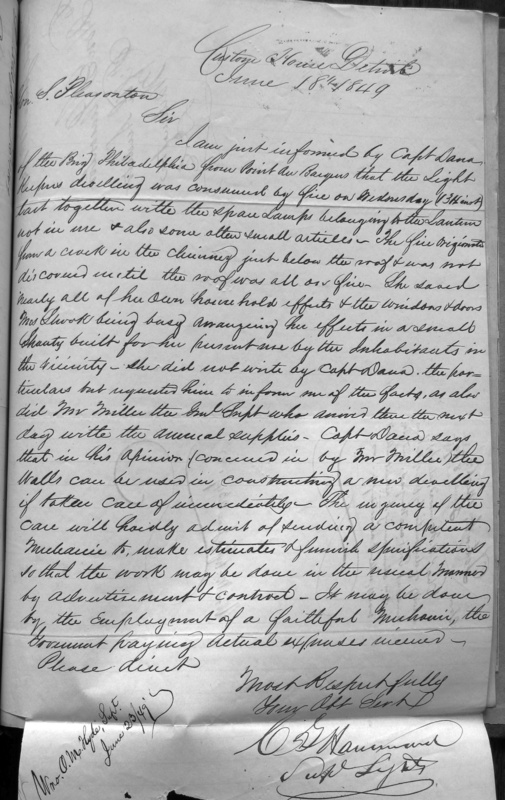 & USLHB, 1851-1907” also include correspondence regarding nominations and appointments. Some volumes contain press copies of appointment letters. Note there is a gap between 1877 and 1905. There are notices of appointment for the 1849-1873 time period in RG 26 Entry 99 (NC-31). For keeper appointments before 1848, I rely on RG 26 Entry 18 (NC-31) “Letters Sent Regarding the Light-House Service, 1792 – 1852.” These volumes record every outgoing letter sent by the administrator of lighthouses, starting with the Commissioner of the Revenue. He would correspond with the local collector of customs who served as superintendent of lighthouses for his region. The collector would be notified whenever a new keeper was appointed. The volumes are indexed. 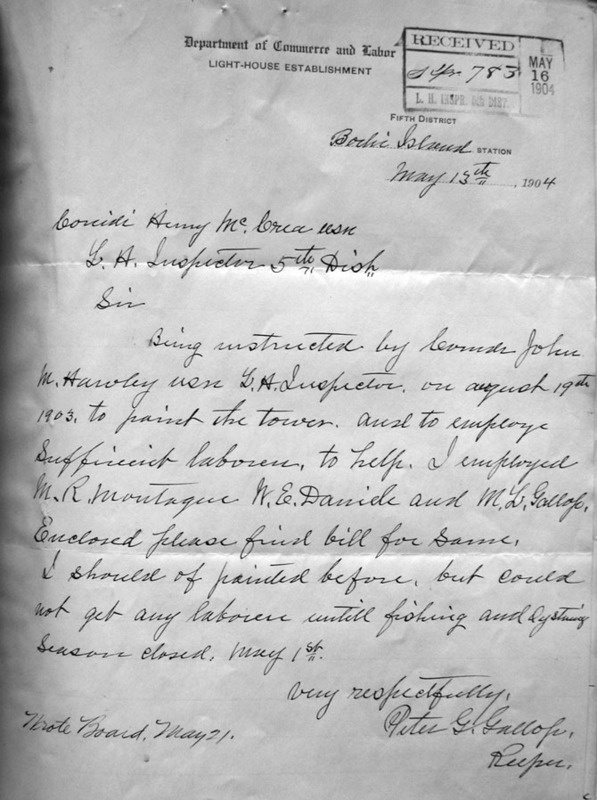 Conversely, the collector would send letters to the lighthouse establishment in Washington notifying them of the need for a keeper, suggesting keepers to be considered for appointment, or any other issues concerning the keepers under their employ. Occasionally the collector would forward a request or report from an individual keeper as attachments. The collector would also submit accounts for paying the keepers. These original letters are organized by the port at which the collector served in RG 26 Entry 17C (NC-31). You can also find keepers in the Federal Registers of Employees that were issued every two years for most of the 19th century. Look under the section for the Treasury Department. It also lists the collectors of customs and USLHB members, engineers, and inspectors. Those volumes belonging to the National Archives can be found in the library at the Archives II facility in College Park, Maryland. I understand that some of these volumes are available online. Early on, appointments had to be approved by the Secretary of the Treasury. Gradually it appears that he was merely informed of changes in keepers. Entry 31 (NC-31) “Letters Sent to the Secretary of the Treasury, 1852-1908” confirm appointments made during most of the U.S. Light-House Board period, 1852-1908. 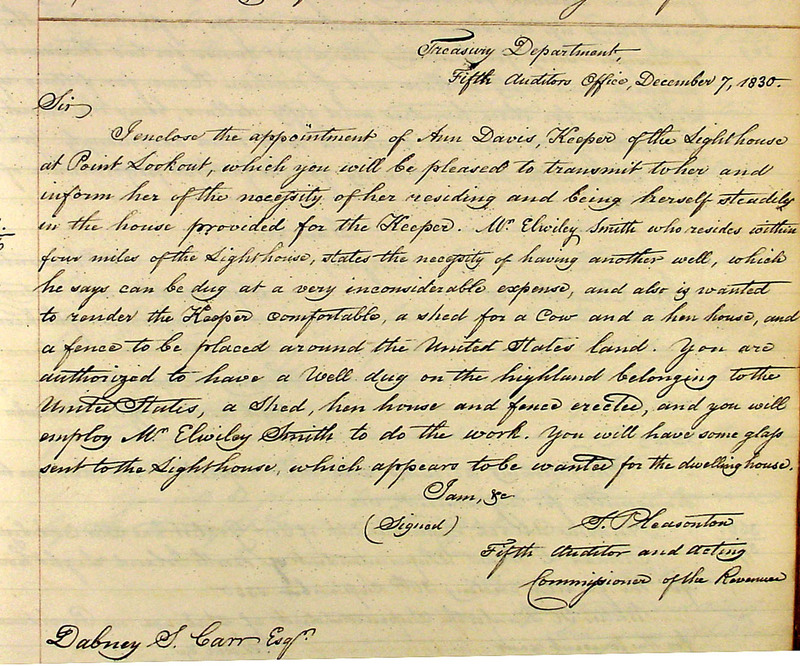 Every keeper was required to sign an oath of office during the U.S. Light-House Board period. 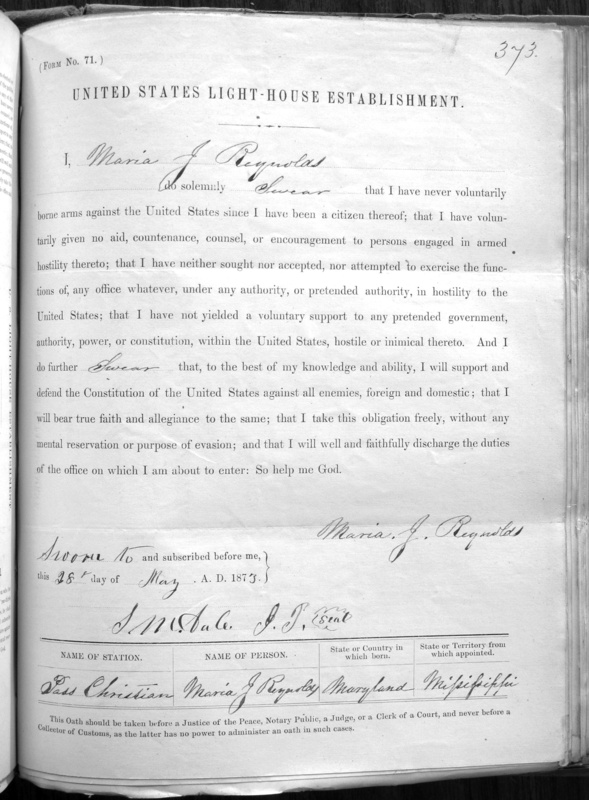 RG 217 Entry 282 includes oaths of offices for all types of Treasury Department personnel, including keepers from 1865 – 1894. If the keeper served after the Lighthouse Service became part of the Civil Service in 1896, there should be a personnel file at National Personnel Records Center in St. Louis. See <http://www.archives.gov/st-louis/archival-programs/civilian-personnel-archival/> for more information. Kraig Anderson includes lists of keepers for each lighthouse on his comprehensize webiste <www.lighthousefriends.com>. Jeremy D’Entremont does the same on his website <www.newenglandlighthouses.net> for New England Lighthouses and Terry Pepper for western Great Lakes lighthouses at <www.terrypepper.com/lights/index.htm>. 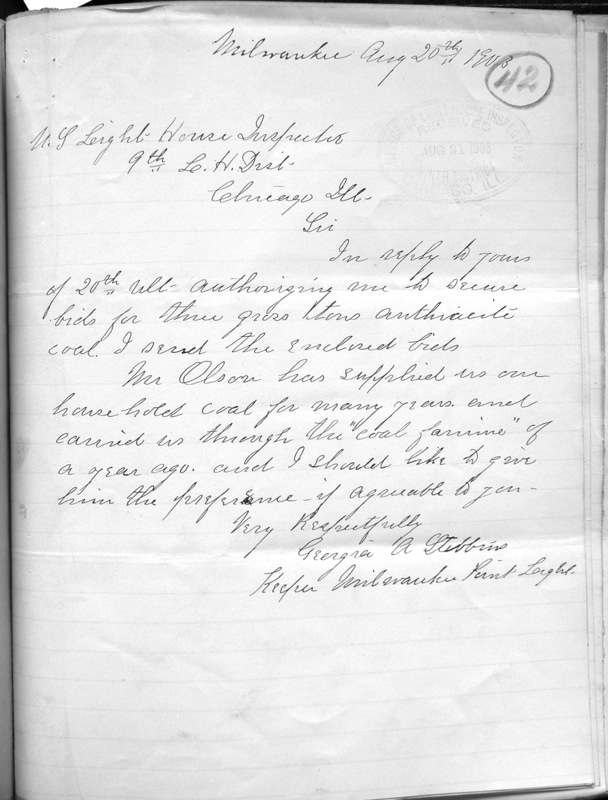 This entry was posted in Historic documents, Lighthouse keepers, Research and tagged Lighthouse Keepers, lighthouse research, National Archives, Record Group 26 on March 26, 2015 by lighthousehistory.